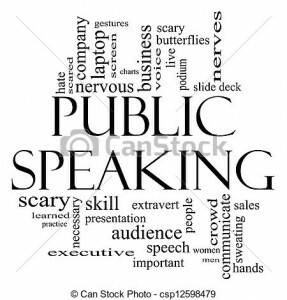 Article originally posted at http://www.fearlesspresentations.com/presenters-here-are-4-powerful-ways-to-start-your-speech. Jitters, sweaty palms, scratchy throat, you’re practically shaking. Someone called you to the stage. The time has come, the time you’ve prepared for — and dreaded — for weeks. You’re about to give a speech. You take the mic and all heads turn to you. Suddenly, you’re extremely aware of the fact that people are waiting for you to say something brilliant. How do you command people’s attention without the usual, “thanks for inviting me” line? We all know starting a speech the right way is critical, lest you lose the audience’s interest. But how do you start a speech with confidence? Grabbing people’s attention requires a bit of creativity, a touch of flair, if you will. Abruptly going into the main part of your speech is a big mistake. Give the audience a teaser first. How would you react if someone calls you a liar? Upset? I bet. But that’s exactly how Pamela Meyer grabbed people’s attention in her speech, How to Spot a Liar. First, she made people laugh by telling them their seatmates are liar. Then she shocked everyone by saying they’re liars, too. By connecting a shocking statement with humor, she helped her audience relate to her message quickly. Including everyone by saying “the person sitting in your very seats is a liar” makes the opening even more powerful because it challenges people’s self-image (‘you’re calling me a liar?!’). It also triggers the typical ‘what’s in it for me’ nature in all of us. Ric Elias’ TED talk, 3 Things I Learned While My Plane Crashed, starts with a powerful opening scene. When you hear him talk, you’ll probably imagine the crash as if you experienced it, too. This strategy is best used for sensational examples, like plane crashes and wild bucket-list type activities. Don’t use this for ordinary stories, where the conversation is the important point and not the actual scenario. Not sure what to do? Just keep quiet. Pausing for five to ten seconds, when everyone in your audience expects you to start talking right away, is a good way to ensure everyone is focusing on you. It also gives everyone a chance to settle down, take a short breather, and finish whatever conversations they’re having. Asking questions is a powerful speech opening but not all questions are created equal. How and why questions are more powerful, as demonstrated by Simon Sinek’s talk on How Great Leaders Inspire Action. Such questions trigger our natural curiosity to understand and solve problems. Read your prepared speech, then think of different ways you can start it using any of the techniques listed above. Look for similar speeches on your topic for inspiration, too.